Anyhow, I picked up Mansoura Ez-Eldin’s Maryam’s Maze because my friend Mai (I’ll paraphrase here) told me, “She’s full of melancholy, just like you are!” Maryam’s Maze was published by AUC Press in English in 2007. It is, as you’d expect, an attempt to escape, to connect, and to find something in a tangled Cairo (sur)reality. The book is particularly interested in inner lives, most especially of women. It has some particularly lucid moments, and is highly recommended by a Banipal reviewer here. You can also read a profile of Ez-Eldin from Qantara, and a short blog entry of hers on literarytranslation.com. 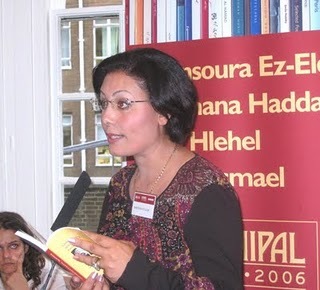 Ez-Eldin currently works as Reviews Editor of the weekly Akhbar al-Adab [Literary News], and seems to have become the “cute face” of the shortlist, her photo appearing with several articles. What’s Ez-Eldin’s nominated book about? Next: The rest of the nominees.